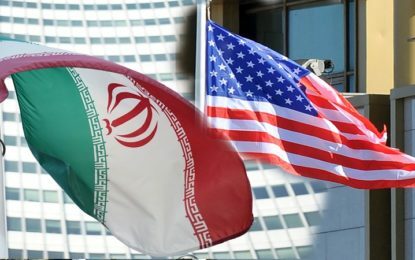 Consistent with the U.S. government’s determination, the 11 countries, in a letter to the United Nations General Assembly circulated Monday, noted that Iran is “constantly interfering in the internal affairs of Arab nations, sparking tension and instability in the region,” reports the Associated Press (AP). “The 11 countries cited Iran’s support for Shiite Houthi rebels in Yemen and the Shiite Hezbollah group in Lebanon which has sent fighters to support the Syrian government,” points out AP, adding that the nations also accused the Islamic Republic of backing “terrorist groups and cells” in Bahrain, Iraq, Saudi Arabia, Kuwait, and elsewhere. The letter was penned by representatives of the United Arab Emirates (UAE) and signed by their counterparts in Saudi Arabia, Egypt, Jordan, Sudan, Morocco, Bahrain, Kuwait, Oman, Qatar, and Yemen. The large majority of the 11 countries are part of the U.S.-backed Saudi-led coalition that has been fighting the Iran-allied Shiite Houthi rebels in Yemen since March 2015. Sunni Saudi Arabia is Iran’s regional rival. As part of the nuclear deal, President Barack Obama paid state sponsor of terrorism Iran at least $1.7 billion in cash. Meanwhile, the Obama administration and the 11 countries have accused Iran of fueling deteriorating security conditions in the Middle East by backing the Houthis in Yemen. “The 11 countries condemned Iran for sponsoring ‘terrorism’ in the region, particularly in Yemen where they said Tehran is supporting the Houthis financially and militarily by training their fighters and illegally sending them weapons and ammunition,” adds AP. Iran is officially listed by the United States as a state sponsor of terror along with Syria and Sudan. In 2015, Iran’s state sponsorship of terrorism worldwide remained undiminished through the Islamic Revolutionary Guard Corps-Qods Force (IRGC-QF), its Ministry of Intelligence and Security, and Tehran’s ally [Hezbollah], which remained a significant threat to the stability of Lebanon and the broader region. Hezbollah, Iran’s narco-terrorist proxy, and the IRGC-QF are also operating in the Western Hemisphere. “Yazdani also accused the UAE and other ‘accomplices’ of ‘funding and arming terrorists in Iraq and Syria and in many other places,’ of repeating ‘baseless claims’ to three islands near the Strait of Hormuz that are controlled by Iran but claimed by the Emirates, and of trying to impede the nuclear deal,” it adds.